The weekend edition of the ‘Daily Slop’, as seen daily on Hogs Haven. Speed does make a difference on handoffs. It might not be much of one, but it exists. Granted, sometimes the landmarks might be a little different in these scenarios, but the overall difference was consistent. When Robert Griffin III handed off in a stretch zone run, it took him approximately 1.10 seconds to get it to the running back each time. When Rex Grossman did it, it took him nearly 1.25 seconds. That’s not a knock on Grossman, but it is an example of the speed. Oh, and it wasn’t just Griffin. Kirk Cousins’ times were about the same as Griffin’s. Linebacker Brian Orakpo lined up in a four-point stance the entire first series (all of three plays). There are some NFL coaches who still think he’d be best used as a 4-3 defensive end, so it makes sense to have him play with his hand in the dirt on occasion. Orakpo likes doing this and it works at times. Like on the first play when he badly whipped the left tackle with a terrific get-off and speed around the edge. That forced Ryan Fitzpatrick up in the pocket. However, thanks to Adam Carriker collapsing the pocket with power, Fitzpatrick had nowhere to go. He sort of slid to his left, but that’s where Ryan Kerrigan was waiting. Kerrigan had looped all the way around, going behind the QB and to the other side. When the right tackle bumped into the left tackle in the backfield, it enabled Kerrigan to get home for the sack. But he got there thanks to the initial work of others. Ex-Redskins Cornerback Fred Smoot joined Holden and Danny to break down Thursday’s pre-season opener. *After defeating the Redskins, Buffalo went on to lose seven of their final eight games of 2011. The good news is, since last we saw these two teams, the Redskins have undergone a pretty serious facelift. 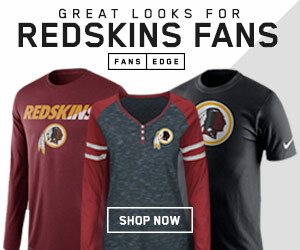 No longer are local fans subjected to the Rex Grossman-John Beck “pupu platter” — not after the franchise traded away a bevy of high draft picks for the right to select Heisman Trophy winner Robert Griffin III. Robert Griffin III’s debut delivered record television ratings Thursday night. 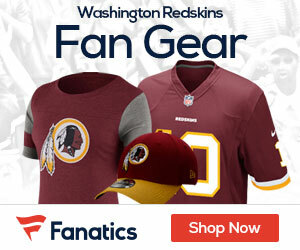 The Redskins Blog | Was Griffin III Robbed Of Perfection? Last night against the Buffalo Bills, Redskins quarterback Robert Griffin III was credited with four completions on six attempts, for 70 yards and a touchdown. Using whatever convoluted system they use to factor QB ratings, NFL mathematicians credited Griffin III with a 145.8 rating–an NFL best among preseason performances. But videographic evidence seems to suggest that during the opening drive, receiver Pierre Garçon actually had two feet in-bounds on his reception, before going out of bounds. The play was incorrectly ruled incomplete on the field, leading to a Sav Roccapunt. Had the call gone in the Redskins’ favor, Griffin III’s final line might have been five-for-six for 84 yards and a touchdown, which calculates out to a perfect 158.3 QB rating in his Redskins debut. Did anybody ask for his opinion? Oh well! Most of the attention in the Washington Redskins’ preseason opener Thursday night in Buffalo was on quarterback Robert Griffin III. But a couple pf other rookies, running back Alfred Morris and cornerback Richard Crawford, also helped themselves with their performances during the Redskins’ 7-6 win. Griffin, the reigning Heisman winner from Baylor and second overall pick in April’s draft, looked as composed and sharp as he did against one of the league’s best defensive fronts. Maybe the best: Mario Williams making his Buffalo debut at left end, Kyle Williams and Marcel Dareus at tackle, and Chris Kelsay and ex-Patriot Mark Anderson at right end. Pierre Garcon may fit the part – Garcon looked like a much more complete receiver than he did in Indianapolis. With theColts, he primarily was used as a deep threat. When the play wasn’t designed for him, Garcon would take the lid off the defense and open up things underneath for Reggie Wayne and Dallas Clark. “I like Crawford. He loves football,” Haslett said on Tuesday. “He works. He’ll do anything. He’ll play nickel, corner, dime and he’ll punt return, so he does a lot of different things.” Crawford wiped out Buffalo’s hopes at a scoring drive late in the second quarter, when he intercepted a Tyler Thigpen pass at the Washington 22-yard line. In the third quarter, he posted his punt return. Crawford fielded another punt but didn’t return the kick after waiving for fair catch. Trent Williams made the most impressive play of the game. The Redskins’ mercurial left tackle got downfield quickly and blocked two defenders at once on the Garcon touchdown catch. Williams is fast, athletic and as talented as any left tackle in the league, and the sense in Redskins camp is that he’s more focused and motivated than he’s been in his first two seasons. He looked tremendous on that play and is capable of dominating at the point of attack and at the second level. Williams injured his foot on the extra point, but Mike Shanahan said after the game that X-rays were negative. It would be bad for Washington if Williams were seriously injured. He is by far the best thing the Redskins’ offensive line has going for it. Notes and reaction from the Redskins preseason opener against the Bills. The regular season is about a month away, and there’s no end in sight to the NFL’s two-month old lockout of its officials. Here’s some thoughts and observations about QB Robert Griffin III’s preseason debut, in which he completed 4 of 6 passes for 70 yards, threw for a touchdown and posted a passer rating of 145.8. Trent Williams might miss time with a sore left foot. In Football Outsiders Almanac 2012, and recently on the website, we introduced the latest iteration of our DVOA formula, which we are calling DVOA v7.0. The biggest change in the new formula is that all years are normalized so the league average equals 0%, and that moves players and teams up and down our all-time rankings depending on how strong offense was league-wide that season. Today, we’re going to continue looking at what the new version of DVOA does to our all-time rankings by looking at the best teams split into offense and defense by run and pass. NFL teams can be fined or otherwise sanctioned if the league feels like it for taking after officials based on in-game situations, but it seems as if the league is just a bit more sensitive about the issue of public criticism of its officials while the actual refs are locked out in a labor dispute. Next Story → Saturday Slop: D.Hall Looking For A Team-Win In Chicago; Will Kirk Cousins win the Backup QB Role?